The Fisher Scientific IsoTemp Water Jacketed CO2 Incubator offers heavy duty construction, a large capacity and precise temperature control and stability. The triple wall construction, and 12 gallons of 37° C water maintain temperature stability and protect your samples against heat loss. This water jacketed CO2 incubator is high capacity, with a 6.5 cubic foot chamber in each system, doubling your available space in the same foot print. Heavy duty stainless steel shelves are strong enough to support a full load of samples, and require no tools for removal. The interior of this CO2 Incubator has a polished stainless finish and coved corners for easy cleaning and sanitizing, while a microbiological filter protects the gas inlet and the sample port. The Fisher Scientific IsoTemp Water Jacketed CO2 Incubator has a variety of safe guards to alert you to changes in parameters, such as alarms for low or high CO2, power interruption and temperature deviations. Settings are easy to input from the front facing digital display, letting users set the levels necessary per run. In the event of a power failure, the water jacketed CO2 incubator can hold temperature for an extended period of time, preserving your samples. 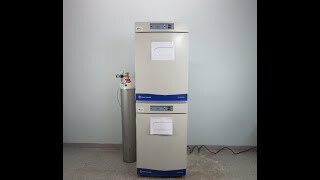 These Double Stacked Fisher Scientific IsoTemp Water Jacketed CO2 Incubators have been tested and are in great condition. All of our lab equipment comes backed with our standard warranty. Should you have any questions, please don't hesitate to contact us.